The Global Volcanism Program has no activity reports for Sangangüey. The Global Volcanism Program has no Weekly Reports available for Sangangüey. The Global Volcanism Program has no Bulletin Reports available for Sangangüey. 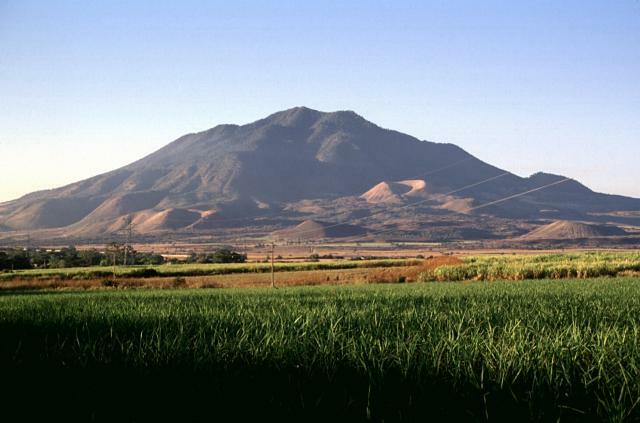 Sangangüey, the highest volcano of the NW-SE-trending Tepic-Zacoalco graben, is an eroded andesitic and dacitic stratovolcano that contains a prominent lava spine at its summit. 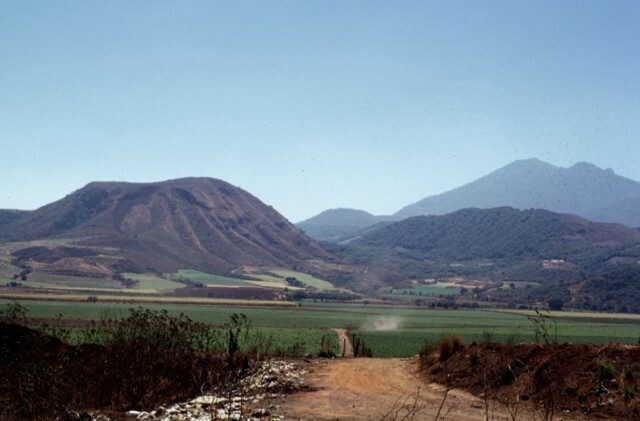 The NW and SE flanks of the Pleistocene edifice of Volcán Sangangüey are dotted with 45 cinder cones that erupted during the past 300,000 years along 5 parallel lines. Some of the cinder cones appear morphologically similar to cones on nearby Ceboruco volcano that are known to be less than 1000 years old. There are no confirmed historical eruptions from Sangangüey. An incorrect report of an eruption in 1859 from San Juan (a synonym of Sangangüey) refers to the nearby Pleistocene San Juan volcano. An Indian tradition records an eruption of Sangangüey in 1742 (Sapper, 1917). If these legends are true, they may refer to an eruption from one of the young flank cinder cones of Sangangüey. Ferrari L, Nelson S A, Rosas-Elguera J, Aguirre G, 1997. Tectonics and volcanism of the western Mexican volcanic belt. IAVCEI General Assembly, Puerto Vallarta, Mexico, January 19-24, 1997, Fieldtrip Guidebook, Excursion no 12, 61 p.
Nelson S A, 1989. (pers. comm.). Nelson S A, Carmichael I S E, 1984. 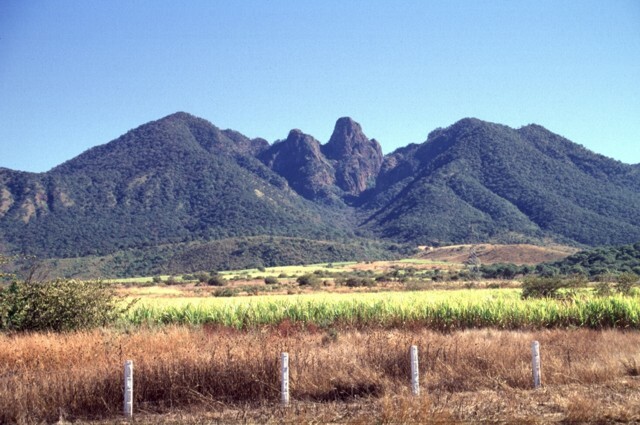 Pleistocene to Recent alkalic volcanism in the region of Sanganguey volcano, Nayarit, Mexico. Contr Mineral Petr, 85: 321-335. Nelson S A, Livieres R A, 1986. Contemporaneous calc-alkaline and alkaline volcanism at Sanganguey volcano, Nayarit, Mexico. Geol Soc Amer Bull, 97: 798-808. Verma S P, Nelson S A, 1989. Isotopic and trace element constraints on the origin and evolution of alkaline and calc-alkaline magmas in the northwestern Mexican volcanic belt. J. Geophys. Res, 94: 4531-4544. There is no Deformation History data available for Sangangüey. There is no Emissions History data available for Sangangüey. Sangangüey is an andesitic and dacitic stratovolcano that contains a prominent lava spine at its eroded summit, seen here from the west. Sangangüey was constructed on the southern flank of Las Navajas volcano. The NW and SE flanks of Sangangüey are dotted with 45 cinder cones erupted during the past 300,000 years along 5 parallel lines. Activity at the main edifice ceased during the Pleistocene, but some of the cinder cones may be only about 1000 years old. Photo by Jim Luhr, 1978 (Smithsonian Institution). The dramatic summit spine of Sangangüey volcano rises 250 m above the Arroyo Caracol, an erosional valley that cuts the SW side of the volcano. The spine is composed of andesitic rocks that are similar in composition to surrounding layered lava flows, but contain less glass, suggesting slower cooling. The spine contains diorite xenoliths that appear to be coarse-grained equivalents of the spine andesites. The Arroyo Caracol exposes a 700-m-thick section of the interior of the volcano. Five parallel NW-SE-trending alignments of cinder cones drape the southern flank of Sangangüey volcano. The light-colored cone below the skyline at the right is designated cone C4, and the darker cone on the lower right horizon is D8. These two cones are part of the youngest age group of Sangangüey cones and may be as young as about 1000 years. A lava flow from the breached crater of cone C4 traveled down the south flank of Sangangüey between the two older cones of B3 and B4, in the foreground. 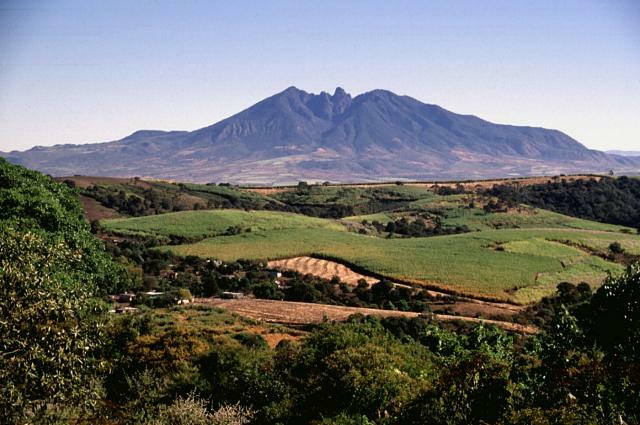 Sangangüey is an eroded andesitic and dacitic stratovolcano that is seen here from the SW across farmlands of the Tepic basin. A prominent spine is exposed in the summit crater. 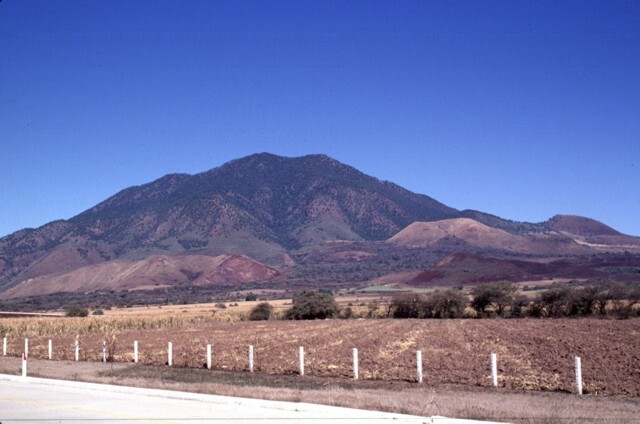 The NW and SE flanks of the edifice of Sangangüey are dotted with 45 cinder cones erupted during the past 300,000 years; some of these NW-flank cones are visible below the left horizon. The main edifice of Sangangüey was constructed during the Pleistocene, but some flank cinder cones may be late Holocene in age. The eroded andesitic and dacitic Sangangüey stratovolcano was constructed during the Pleistocene. Although its summit vent has not been active since, its flanks are dotted with 45 cinder cones, some of which have erupted during the Holocene. The cone forming the peak along the lower right horizon and the prominent cinder cone highlighted by the sun below and to the right of the summit in this view from the south are, along with other nearby cones, among the youngest. These cones may be only about 1000 years old. Volcán el Molcajete (left) is the largest cinder cone on the NW flank of Sangangüey volcano (upper right). The crater of the alkali-basaltic cinder cone is breached to the NW and was the source of a lava flow that traveled across the floor of the Tepic valley. The flanks of the cone are dissected, and El Molcajete is intermediate in age among the pyroclastic cones of Sangangüey volcano. Photo by Jim Luhr, 1999 (Smithsonian Institution). A SE-trending chain of cinder cones extends beyond the flank of Sangangüey volcano into the Tepic basin. 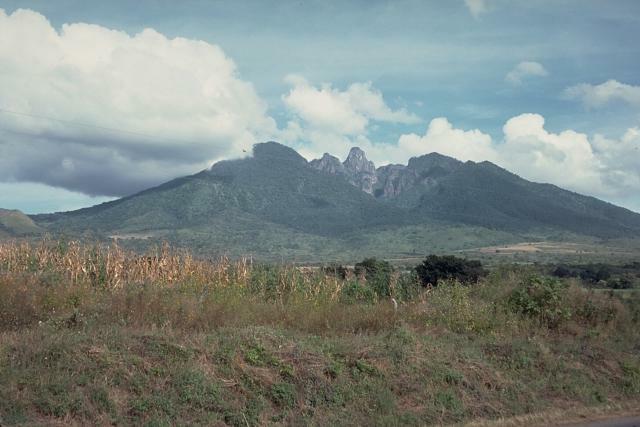 Cerro el Molcajete, the flat-topped peak at the right, shares the name of Volcán el Molcajete on the NW flank of Sangangüey. 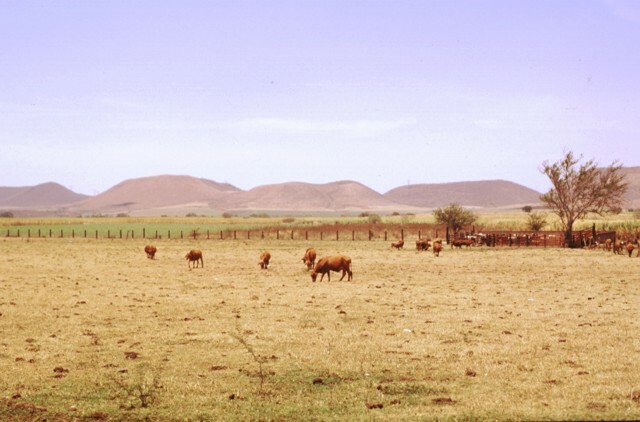 This NW-SE-trending alignment of cinder cones is seen here from the south across farmlands near the village of El Limón. These Pleistocene alkali basalt and mugearite cones are part of the oldest age group of Sangangüey cones. The hills in the center of the photo form part of the SE-flank cone alignment on Sangangüey volcano. This view looks to the SE from the side of cone C4. 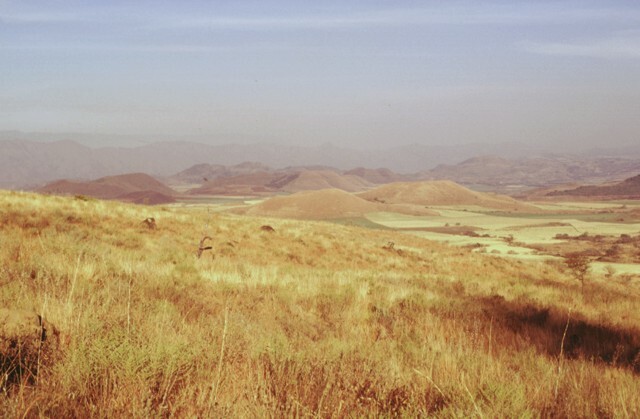 The cones extend beyond the flanks of Sangangüey into the Tepic basin towards the Pleistocene Santa María del Oro maar, which is not visible in this photo, but was erupted through Miocene ash-flow tuffs beyond the cinder cones. The following 23 samples associated with this volcano can be found in the Smithsonian's NMNH Department of Mineral Sciences collections, and may be availble for research (contact the Rock and Ore Collections Manager). Catalog number links will open a window with more information. Large Eruptions of Sangangüey Information about large Quaternary eruptions (VEI >= 4) is cataloged in the Large Magnitude Explosive Volcanic Eruptions (LaMEVE) database of the Volcano Global Risk Identification and Analysis Project (VOGRIPA).